Fruit is something your body simply can’t get enough! It’s healthy, full of vitamins, good for your digestion, your skin, and overall health. The facts being said, it’s time to combine your favourite pieces into lovely skewers that will be irresistible to avoid. Get creative and have fun – a good recipe is all about that! 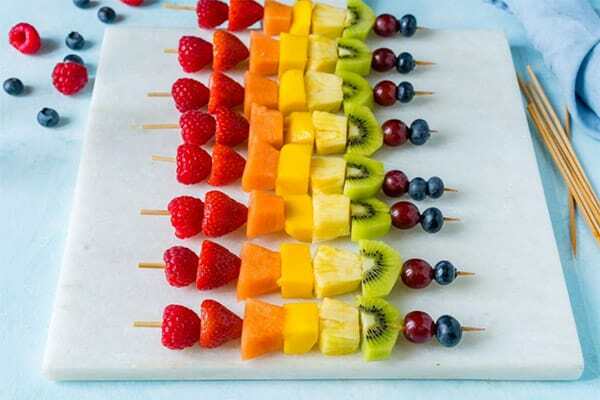 Thread fruit of choice (strawberries, mango, cantaloupe, pineapple, dates, apple, etc) onto small skewers. Sprinkle with lime juice. Arrange on a glass platter. Serve with lemon light fruche. A light warming under the griller or on the barbecue makes these delightful fruit kebabs very flavoursome!.